Zuckerberg: "We Are Building A Web Where The Default Is Social"
Today at Facebook’s F8 conference), Mark Zuckerberg laid out his plan to turn the Web into “instantly social experiences.” The building blocks to this super-social Web are Facebook’s new Open Graph and Social Plugins, which include new “like” buttons everywhere on sites outside Facebook.com, auto-login capabilities for those sites without clicking on Facebook Connect, and even a Facebook social bar which includes several of these plugins plus Facebook chat (goodbye, Meebo). We’ve reported on all of these new features before, but today Zuckerberg put them into context: “we are building a Web where the default is social.” How is Facebook doing this? First and foremost, Facebook has redesigned its Graph API for developers so that not only can they see the social connections between people, but they can also see and create the connections people have with their interests—things, places, brands, and other sites. Zuckerberg calls it the Open Graph (as opposed to the Social Graph). It is really an Interest Graph. Facebook wants to developers to create subsets of the Open Graph around interests and things. Yelp might create one around restaurants, Pandora might create one around music, Netflix around movies. Add some “like” buttons and anytime someone likes a restaurant, song, or movie anywhere on the Web with a Facebook like button, that information will flow back into the Open Graph. So that Yelp will know what restaurants you and your friends have liked elsewhere and take that into consideration when giving you recommendations, or Pandora with music, and so on. (Yelp and Pandora are real examples, Netflix isn’t). Facebook is taking some of the information that pops up in people’s realtime streams and baking it into the Web. 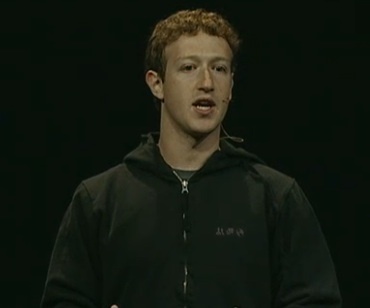 “The stream is ephemeral,” says Zuckerberg. “It is there for a few hours and then it mostly floats away. Services don’t understand the semantic connections between you and that restaurant.” But now Facebook can. Instead of the Web being defined only by hyperlinks (to the benefit of search engines like Google), Facebook wants it to be defined by social connections, likes and dislikes, interests that are coded and machine-readable. “Our goal is to use the open graph so people can have instantly social experiences wherever they go,” he says. Add this open graph to plug-ins like activity stream and recommendation stream widgets Websites can put on their sites. And to remove the friction of interacting with this Open Graph even further, no login is even required. Instant socialization and instant personalization of every site on the Web is the goal. Imagine coming to TechCrunch and seeing every story your Facebook friends have “liked” or going to Amazon.com and seeing the same thing for products. (Again, these are hypothetical examples for now, but why not?). The Open Graph is hugely ambitious. Just wait until Facebook plugs in targeted advertising.